In the world of the internet everything needs to be just right; no elaborate words, no jargon, no frills and certainly no long – unnecessary descriptions and details (at least in the form of a paragraph) that make you just want to click away from the site as soon as possible. Internet audience and internet commerce attached require things to be precise, to the point and in the most ‘glance friendly’ mode as possible. But this is a double edged sword, while on one hand you cannot have a product description that is too long, traditionally product descriptions are on the other end of the spectrum – long. The key is to find a sweet spot, a balance between both the worlds and this is best achieved in the form of tables. Now you may say, tables, well that sounds a little, boring, but a table puts in descriptions in a concise form, categorising them so that you can get the exact information you need about the product without going through information that you don’t really need about the product. While there are many listing plugins out there, the one that sticks out is the WooCommerce Product Table, a support plugin for ecommerce sites on WordPress. 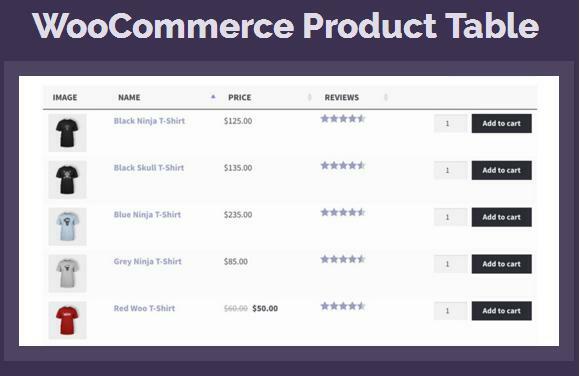 WooCommerce Product Table (demo) provides an easy and efficient way to enlist all your products as well as description and other specifications for customers or basic data cataloguing. All this information is sorted out in a search friendly manner which is organised in a table format. For optimised search ability WooCommerce Product Table uses jQuery DataTables plugin which manages the sorting out of data, categorising it, making it easily searchable. The plugin is also responsive and works on different devices making it not only easy to view, but also extremely easy to work with. The installation of the product table is fairly straightforward; upon purchase (at a nominal fee of $49); you can download the plugin files of the WooCommerce Product Table after which you will be given your licence key. The key is essential for the plugin to work and for usability of the application. The licence key is used to activate the plugin and once that is done, the Product Table is good to use. The software is pretty easy to use but in case you do get stuck at some point, there is an extremely helpful document that explains everything in detail, right from the installation to a step by step instruction on how to go about different features on the plugin. From being extremely easy to use, the table is flexible and intelligent, configuring your needs while making minor adjustments that makes working with the software hassle free. The software is responsive; the Product table is optimised for viewing from different devices, i.e. laptops, mobile devices tablets etc. The software automatically folds and expands columns depending on the priorities you set for it. Apart from the above features, the plugin comes with a ‘click to search’ option and also an ‘add to cart’ button. You can add pictures of your inventory to make your table more attractive along with the AJAX support feature that enables aligning your products consecutively in pages loading one page at a time, reducing server load and risking your site getting slow. You can also sort out products in as many categories as you want, giving you further control on the finer details. And if you thought that the WooCommerce Product table was just meant for product inventory and nothing else you are mistaken, the flexibility of the software, usability and responsiveness makes it the perfect candidate to use for any sorting of information; it just depends on who is using it. So, if you are a proud owner of a WordPress site with lots of products that needs categorization into neat tables, you now know just the right product to go for, WooCommerce Product Table today!